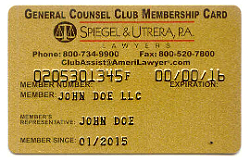 ﻿General Counsel Club - Unlimited Legal Assistance - Amerilawyer.com - Spiegel & Utrera, P. A. General Counsel for your business - Let Spiegel & Utrera, P.A. help you grow your business. Unlimited legal advice - both business and personal. Click here or on our card and become a member today (or to renew your membership)! Select this valuable service at the time of ordering your corporation or LLC and receive an additional one month Bonus – so that your first year of service will cover 13 months. PLUS take a $50 discount, so you PAY ONLY $89.95 for the first 13 months of service. NON-General Counsel Club members can still receive legal and strategic business advice at an affordable rate of $50 for each 15 minutes or fraction thereof with a 15 minute minimum. Simply call 1 (800) 734 - 9900. Spiegel & Utrera, P.A. will act as your corporation's General Counsel. What are the benefits of incorporating or forming a Limited Liability Company? Does "Full and Final Payment" end a dispute? You will receive the Spiegel & Utrera, P.A. newsletter, "Entrepreneur's Alert®", which is published six times per year by Spiegel & Utrera, P.A. You are entitled to place an advertisement for up to one year on the Client Bulletin Board on Spiegel & Utrera, P.A. 's website. You may change your ad monthly. The ad classifications are Business Opportunities, Franchises, Capital to Invest, Capital to Lend, Capital Wanted and Miscellaneous. Please go to www.amerilawyer.com/clientbulletinboard/ to enter your advertisement. Start receiving unlimited legal and strategic business advice now!